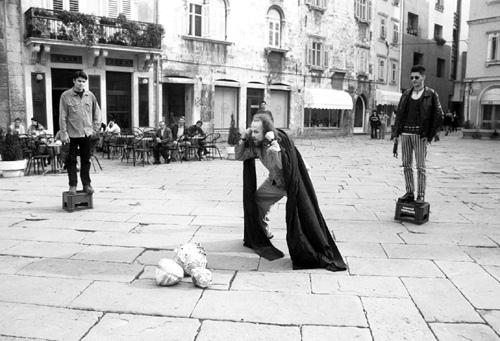 Milan Kohout: 1999, PULA, CROATIA, "I do not want to be leashed"
1999, PULA, CROATIA, "I do not want to be leashed"
FORUM, CROATIA, INTERNATIONAL ART EXCHANGE PROGRAM BETWEEN MOBIUS AND ARTISTS FROM PULA, PUBLIC PERFORMANCE IN TRG FORUM "I DO NOT WANT TO BE LEASHED"
This performance addressed the xenophobia present among the predominately white Croatian population, by recently uncovered evidence that many war crimes during a recent war in Croatia (1991-95) were actually committed by civilians. The civilians expelled many Croatian citizens of different ethnic minorities from their homes, and if they resisted, they were killed. I asked four casual bystanders on Trg Forum in Pula, a symbolic gathering place of local citizens, to step on milk crates organized in a circle, and hold dog leashes, which I provided to them. Then I placed three paper balls containing big pieces of blue, white and red fabric in the center of the circle. The colors referred to the Croatian flag. Then I completely covered myself by black fabric and entered the circle. As the performance progressed I approached each of the three paper balls, removing the different colors of fabric and wearing them over my initial black wrap. After each approach of the paper ball I hooked myself to each the bystanders on the crates so that I became leashed like a dog step by step from four different sides - complete manipulation. Before each "attachment" I asked the bystander to teach me about the typical song, food, smell and color of Croatian culture, referring to the four human senses which we all share. After a while walking in the circle on the leashes, I become tangled with the leashes so that it made me absolutely immobile: the cultural hegemony had prevailed. Then I rebelled and threw off my body red, blue, and white fabric. I untangled myself from the leashes and connected them so that the four bystanders were leashed to each other. Then I escaped from the circle wearing only black again.